Field personnel have requested information regarding the safest and most efficient method to counter the hose nozzle reactive force generated during annual fire engine service testing. The San Dimas Technology and Development Center recommends that fiberglass sandbags be positioned across and down the entire length of the hose, with more weight added at the nozzle end to secure it in place. To ensure safe practices, no one should hold the nozzle. Follow all safety precautions discussed in the "Wildland Fire Hose Guide," PMS 466, NFES 1308, Febbruary 1997, "Safety in Testing" section, and NFPA 1911, "Standard for Service Tests of Fire Pump Systems on Fire Apparatus," 1997. It is important to use the proper weight in sandbags to effectively counter the amount of hose thrust or nozzle reactive force. The counterweight can be determined by calculating the nozzle pressure and then the nozzle reactive force. 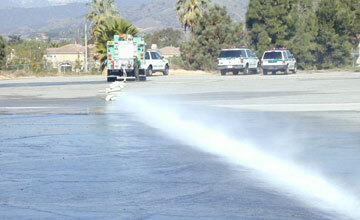 Use the bore diameter of the nozzle and the flow in gallons per minute to calculate the nozzle pressure. Use that to determine the nozzle reactive force (See figure 1). Figure 1—Nozzle reactive force generated during service testing. Example: How many pounds of sandbags should be used to counter the reactive force generated by a 1.25 inch-or a 1-inch-bore-diameter nozzle at 400 gallons per minute? 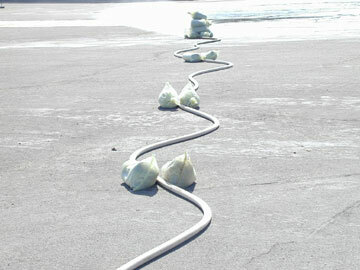 Figure 2—Sandbags are used to counter the reactive force during service testing. If the bore diameter is reduced to 1 inch, the nozzle reaction at 400 gallons per minute is significantly increased to 285 pounds reactive force. With a Factor of Safety of 2 to 3, it is recommended that 600 to 850 pounds of sandbags be used to counter the nozzle reactive force. Use 400 to 600 pounds of sandbags for the 1.25-inch-bore-diameter nozzle and 600 to 850 pounds for the 1-inch-bore-diameter nozzle at 400 gallons per minute. For added safety and strength, use double-bagged fiberglass sandbags. Double-bag by filling a bag with sand, tightening up the fastener, turning the bag upside down into a second bag, and tightening up the second bag's fastener (See figure 3). Some hardware stores sell fiberglass sandbags with an attached metal ring designed to tie two sandbags together. Using a scale, fill all sandbags to the same weight. Always doublecheck the weight. A bathroom scale is adequate. Figure 3—Double-bag for increased strength. General-purpose sand that is packaged in either a plastic bag or a paper wrapper should be double-bagged with the fiberglass bags for added safety. Bags wrapped in paper should be split open inside the double sandbag, allowing the sandbag to be pliable and drape over the hose. 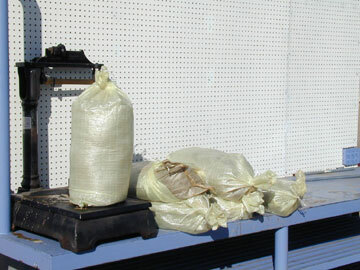 Fiberglass sandbags at a home improvement store cost approximately 25 cents each. General-purpose sand, also available at home improvement stores, costs approximately $1.25 per 38 pounds (0.5 ft³). The total cost of one 38-pound sandbag with double-bagging is $1.75. If 600 pounds of sandbags are used, the cost will be $28. Labor required to double-bag is minimal. For further information, contact fire program leader by phone at (909) 599-1267, or by fax at (909) 592-2309.